Pier 59 Studios held the first collaboration between two brands Robert x Lululemon Fall/Winter 2019 New York. Mountain climbing, but make it to the moon. The designer took an outdoor adventurer tone for fall. 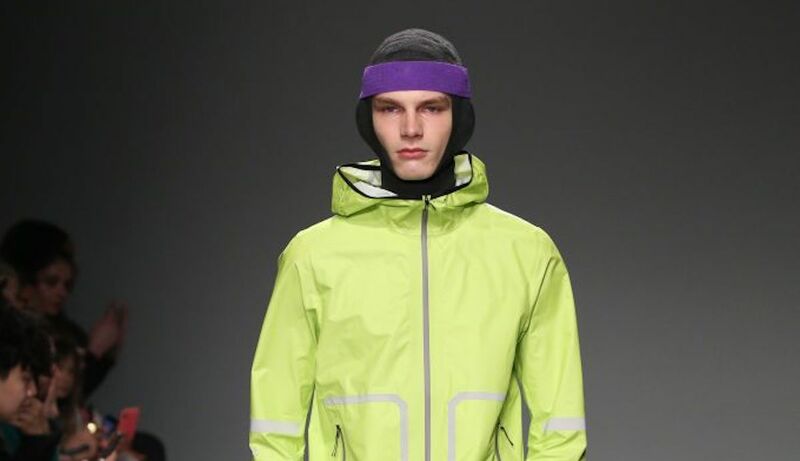 Robert Geller is taking us on a mountain-climbing expedition this fall.After a three-season hiatus, the designer returned to New York Fashion Week: Men’s with a collection that took him into new territory. He applied his traditional romantic DNA to a performance-driven lineup spurred on by a new collaboration with Lululemon.“Lulu pushed me in that direction,” he said. “But it’s also the spirit of the times and knowing the functionality of the garments.” The use of bright neon greens and fuchsias in sweatshirts, pants and suits kept the athletic spirit at an all-time high. And a ubiquitous moon-pattern print that he used in coats, silky shirts, scarves and leggings was part of his fictitious mountainous climb to the moon. A take on the slogan “I love you to the moon and back” was added to hooded sweatshirts and served as a reminder that Geller is still a romantic at heart. While the Lululemon collaboration set the tone, Geller’s main collection concentrated around layered wool garments with some innovative dying techniques as seen in oversize wool coats, blazers and jackets all with nylon 3-D utility pockets.